TL;DR- Please consider clicking the commit button for the proposed site. The biggest hurdle is getting people who already participate in stack exchange sites to commit, here are three ways you can help with that. 1) If you have over 200+ rep on any stack exchange site we really need you, please commit. 2) If you don’t, consider answering, asking and commenting on any one of the 80 some stack exchange sites that relate to your other interests. It won’t take long to get 200 rep and you will learn about the system. After answering and asking two questions on the Academia site I had more than two-hundred rep.
3) Please send a link to the proposal out to others in your organization or email lists that you are on. In particular, please share this with groups of folks at your org likely to have participated in stack exchange sites, like software developers, system administrators, and folks in the sciences who you think might be interested. 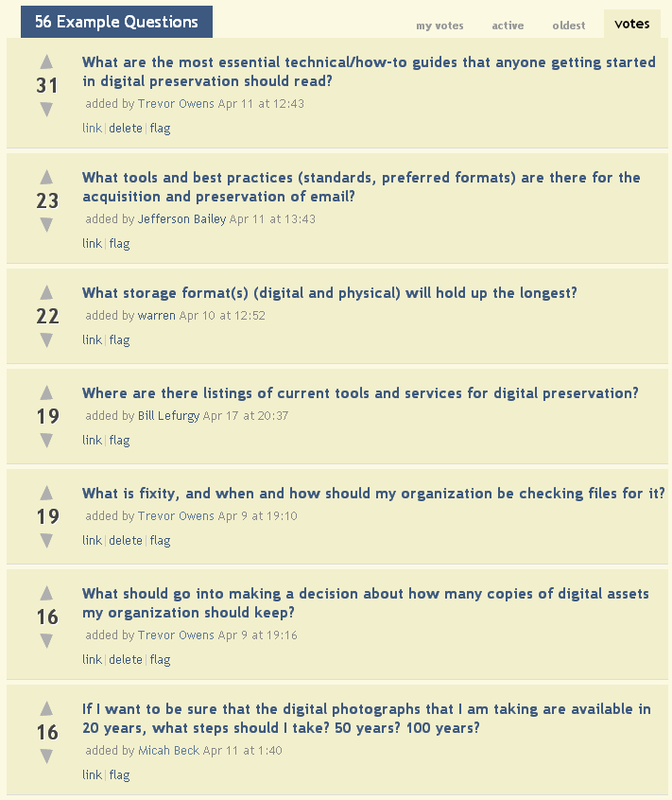 A few of my colleagues at a range of different national and international organizations working on digital preservation have put together a proposal for a new Stack Exchange question and answer site focused on Digital Preservation. You can see the initial definition for the site below. At different conferences, and different projects I’m associated with I keep hearing a lot of the same kinds of questions. I feel like there should be a place where I can point folks to a solid Q&A knowledge base. While there is an abundance of good research on digital preservation, great standards documents, and a range of different levels of solid technical guidance there isn’t really a place to go where you can ask and find answers to the kinds of straightforward questions seen below. I’ve talked with folks about starting our own site, like what DH Answers did. However, in further discussion we thought it would be better to first try and see if we could get something started through the Stack Exchange process. Here are some reasons to do this thorough Stack Exchange. Built in network effects: Many of the existing stack exchange sites, while very distinct from digital preservation, have people who overlap between them. Being on Stack Exchange means being in an integrated network of sites that others already participate in. Open Data Dumps and CC-BY Knowledge: Importantly, all the content of Stack Exchange sites is open data in several levels. We can take it, move it, share it and build from it. Not having to support technical infrastructure is nice: Stack Exchange has a dedicated staff working on refining and enhancing their platform, so the folks who want to participate can focus on the Q&A. Outreach and Big Tent Digital Preservation: Promoting the proposal is a chance to reach out to members of other professional and technical communities to raise awareness of digital preservation. Further, if the site is launched, being part of Stack Exchange’s network would help to generate more traffic to discussions and could help lead to a broader base of digital preservation professionals. The process of proposing the site helps conceptualize it: I already think of this as a win. Just the existing prioritized list of questions that folks have is a great resource in and of its self. Even if the proposal fails and we end up needing to think about standing up our own Q&A site the process we went through on Stack Exchange will be helpful. Getting some seasoned Stack Exchange folks involved will help digital preservationists cut their teeth on best practices for participating in Q&A sites: There is an art to composing good questions and a related art to composing good answers. Getting some seasoned Stack Exchange folks in the mix would be helpful in getting us to do this in the best and most useful way. For anyone unfamiliar with Stack Exchange their about page is a nice quick read. I’ve copied some of their info below to give a bit of context for how they describe themselves. Stack Exchange is a growing network of individual communities, each dedicated to serving experts in a specific field. We build libraries of high-quality questions and answers, focused on each community’s area of expertise. From programmers sharing answers on parsing HTML, to researchers seeking solutions to combinatorial problems, to photographers exposing lighting techniques, our communities are built by and for those best able to define them: the experts and enthusiasts. Other ideas? Places to Reach Out To? If you have some other ideas for how to make this happen I want to hear them! Are there other groups to contact? I bet there are, share your ideas in the comments and I will follow up with them, or just take the lead and go contact some folks yourself.